2 Pairs of Stainless Steel Earrings only $5 + Free Shipping! 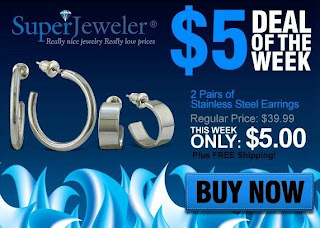 Head over to SuperJeweler to score two pairs of stainless steel earrings for only $5 with free shipping! These regularly cost $39.99. These simple, yet beautiful set of 2 - huggie and hoop earrings are so comfortable that you won't even feel like you are wearing earrings! They work as either mens stainless steel hoop earrings or as ladies hoop earrings. The stainless steel huggie earrings are 1/2 an inch in diameter, while the hoops are the size of a quarter.